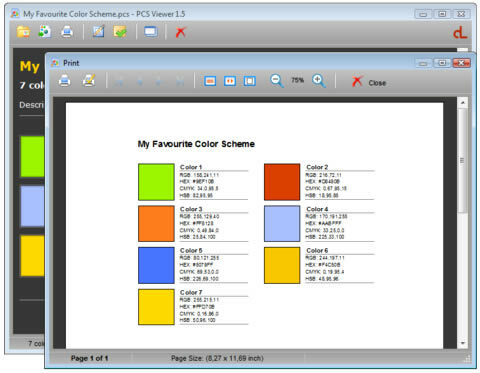 PCS Viewer 1.5 is a free Color Scheme viewer. Opening, displaying even printing color schemes that you have been created with Pixel Pick. Visualize the colors and the values: RGB, CMYK, HSB, HEX or Web color values. Added New Feature you can print your color scheme to a printer. Added New Feature on this release : you can print your color scheme to a printer. Now you can edit description of the color scheme to help you to remember what is the color scheme represent for. 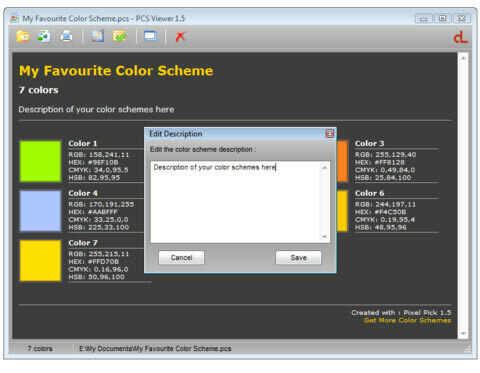 Note: Old version of PCS Viewer will not be able to open the schemes with description. So Upgrade your viewer Now! Simply double click PCS file in Windows Explorer and then PCS Viewer will open and displaying the schemes and color values, even you select multiple PCS file. Drag and Drop on It! When exploring your color schemes collection, drag a single PCS file from Windows Explorer to the PCS Viewer area and drop it, the viewer will display the scheme. Export opened PCS to HTML or Text File you can also open them with PCS Viewer with the menu File-Open command or drag and drop feature.